Older viewers of Legit may well be offended by the series' lewder, cruder proclivities, while younger viewers (most probably the show's preferred demographic) may be wondering what is up with all the heartstring tugging the show indulges in. Stand-up comedy is no laughing matter. Well, let me rephrase that. The business of stand-up comedy is no laughing matter. Australian stand up Jim Jefferies isn't exactly a household name in the United States, but he's the latest comedian to try to transport his routines, at times whole cloth, into an often snarky sitcom format. If the most successful of the most recent glut of cable outings in this subgenre is Louis C.K. 's Louie, there's a longstanding tradition in this arena that stretches back to Seinfeld. Jefferies is therefore the latest in a long line of stand-up comedians trying to slightly alter their stand up personas in a somewhat more structured format, though in the case of Legit that structure is often as loose limbed as its star. Jefferies' humor is often politically incorrect (a recurring character is a severely disabled young man who is the brunt of many jokes), but it's actually the show's tendency toward touchy-feeliness that may end up annoying what is probably its younger male demographic. Jefferies plays a "character" named Jim Jefferies in Legit, though probably only his hairdresser (or perhaps his mother) knows for sure how much this sitcom creation actually mirrors the real life person. In the show, Jefferies is approaching middle age and has yet to really grasp the brass ring, something that sets his mother (who is recurrently at death's door) into a depressive fit. When Jim's best buddy and roommate Steve (Dan Bakkedahl) tells him the best way to get out of his head is to help other people, inviting Jim to visit Steve's disabled little brother Billy (DJ Qualls), Jim initially demurs, but ultimately decides he'll go, if only to assuage his somewhat guilty conscience (he had previously pushed Billy into a river in his wheelchair). At the hospital, Billy confides in Jim that he's still a virgin and wants Jim to help him undo that problem. He also swears Jim to secrecy. Within mere seconds, Jim has agreed to the task while also alerting Billy's entire family, including Steve and Steve and Billy's harridan mother Janice (Mindy Sterling). Jim has also posted his plans to take Billy to Vegas to meet some hookers, something that has become viral on social media. Obviously, Legit is not overly concerned with nuanced comedy—this is rude, frat boy humor most of the time, and if it's undeniably funny at times, it's also intentionally provocative and will certainly not be everyone's cup of tea. Perhaps surprisingly, Legit continues to develop a kind of long form plot arc style through its first season. Billy ends up hanging out with Jim and Steve at their grimy bachelor pad, and even more hookers show up in tow. The show continues to show a group of somewhat unlikable characters (think Seinfeld or even It's Always Sunny in Philadelphia) repeatedly triumphing over more decent types despite unlikely odds. There's a deliberately gauche aspect to some of the humor that is probably Legit's best feature. Remember that old I Love Lucy episode called "The Handcuffs" where she had to pretend to be Ricky's arm and hand when the two were handcuffed together? (Lucy later repeated this bit when she had Elizabeth Taylor and Richard Burton on as guest stars a couple of decades later and she got Liz's immense diamond ring stuck on her finger.) There's a decidedly lewder version of that gambit in a later episode of Legit where Billy hooks up with an internet chat woman who wants to see him pleasure himself. Since he has no control over his own arms and hands, Jim has to step in to "become" Billy's hands. This crude kind of humor may be the show's best feature, and had Legit left well enough alone it probably could have been quite attractive to its core demographic. But the show wants to have heart as well, and whether it's telegraphing what we should be feeling in insistent source cues or trying to show a kinder, gentler side of Jim at times, the show stumbles precipitously in these moments. A better balance needs to be found in order for the humor to land more consistently. Sometimes it's better to just admit you're a lout and move on. Legit: The Complete First Season looks okay in standard definition DVD but it rarely really pops with the best of them. Part of this is due to the series' tendency to shoot in low light situations, especially some of the dank interiors like Jim and Steve's shabby apartment. When the series ventures out of doors in daylight or gets into more robustly lit environments, things look rather good, with a nicely sharp, well delineated image that provides good if not overwhelming fine detail. 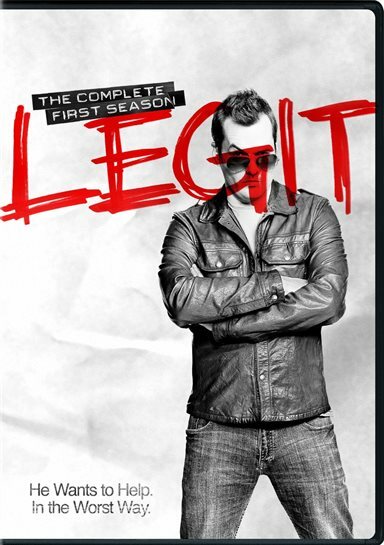 Legit: The Complete First Season offers a nice sound mix that nonetheless only really exploits the surrounds consistently in the series' use of source music and occasional ambient environmental effects. This is generally a smaller scale show built out of interchanges between a few characters at a time. Fidelity is excellent with no issues of any kind to discuss. Jim Jefferies' Journey supposedly gives some background on Jim. Some may question the absolute veracity of some of the information imparted. Older viewers of Legit may well be offended by the series' lewder, cruder proclivities, while younger viewers (most probably the show's preferred demographic) may be wondering what is up with all the heartstring tugging the show indulges in. Some of Jefferies' stuff is very funny, but the show tries to please everybody some of the time, rather than appealing to a smaller niche all of the time. This probably won't threaten Louis' reign as the current stand up sitcom champ, but Legit has the potential to be a contender. Download Legit from the iTunes Store in Digial HD. For more information about Legit visit the FlickDirect Movie Database.